Medscape recently published a short essay of mine, Rx: Exercise Daily — in Nature. Doctor’s Orders. It is also viewable and downloadable here without login, as some people are not signed into Medscape but still want to read it. It is a quick summary of scientific evidence for how exercise in nature changes the brain, and your health, all for the better, and why physicians don’t write exercise prescriptions often enough. It’s unusual for a high profile site like Medscape to publish a piece about nature therapy, especially by a physician, so see what you think, and share it if you like. 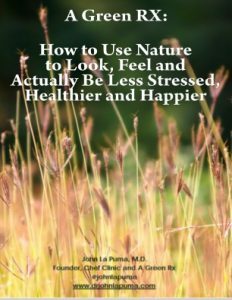 I think nature therapy, in combination with culinary medicine is going to make a significant contribution to well being and health in the next decade, and it is an important, underutilized set of therapies which are fun to boot!